Using our console. To order Reliant. To lower her shields. As geeky as this sounds, there was once a point in time when I could recite the accompanying dialogue and sound effects in sequence with this composition. It’s music from The Wrath of Khan, the scene where the Enterprise has been crippled by Khan’s surprise attack and Captain Kirk must stall for time in an attempt to deliver a retaliatory blow to the Reliant (the ship Khan has commandeered). It’s an exciting scene through-out and the tension slowly builds to an explosive climax, helped to tremendous effect by a near-perfect score. From a James Horner album that’s actually good, here’s Kirk’s Explosive Reply. James Horner is a hack. That’s my opinion. Some people think he’s a good or even great composer. I don’t. I happen think he has precisely 1.5 Good scores to his credit, namely Star Trek 2 and 3. Those two score, I also happen to think, are among the finest score of the late 20th century, with an asterisk. (the asterisk being that the highlights of each are highly derivative of Prokofiev). 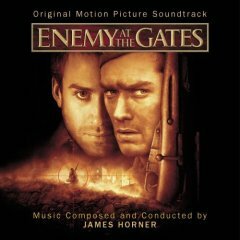 I mention it because I listened to Horner’s score for the 2001 film Enemy at the Gates today and was once again frustrated by the music. Despite my accusation above, Horner can be a talented composer, I just think he’s fond of shortcuts that lower the quality of the final product. For example, this Enemy at the Gates score opens with the type of epic 15+ minute suite The River Crossing to Stalingrad that I am quite fond of. It effectively incorporates an all-male chorus and evokes the same Slavic character that I enjoy in Dvorak’s and Tchaikovsky’s work. Additionally, there are some really nice melodic passages throughout the score. And this is a deal-breaker, horner re-guritates the same "Menace" Motif that he originally wrote for StarTrek 2 (1982) and already recycled at least once for Aliens (1986). And this motif is everywhere in the score, ruining what might have been compelling music. It’s not the motif’s fault really. It’s actually a simple and effective couple of bars of music. But in my mind, it is far too overused and too closely related to Khan for it to work anywhere else. So I may hang on the opening suite, but the rest of this score will be departing my library.